The Knights of Columbus is a Catholic fraternal benefit society founded in 1882. Today, it is the world’s largest Catholic fraternal service organization. The Knights of Columbus have been involved in a large number of service projects that include participating in programs with groups like Habitat for Humanity, providing new winter coats to children, and stocking food pantries. What is the Mission of the Knights? With a mission of charity, unity, fraternity and patriotism, the Knights of Columbus Council 809, part of the Knights of Columbus Washington State Council has been operating continuously since 1902 at Saint Patrick Catholic Church. Their goal is to provide Catholic men with an opportunity for direct involvement faith enriching programs. The Knights provide financial support to seminarians— 4 seminarians each year and follow them through their journey to priesthood. The Knights also provide in-kind and financial support to persons with disabilities, international relief, pro-life efforts, clergy appreciation, the Dominican Sisters of Tacoma and Boy Scout of America projects. How do the Knights Fund Their Mission Work? Together with their families, the Knights sponsor social events to raise funds required to support their mission. The Knights of Columbus calendar includes hosting Lenten Fish Frys, the St. Patrick’s Day Corned Beef & Cabbage Dinner and Pancake Breakfasts and Blood Drives on the 5th Sunday of the month and more. The Knights host a monthly Rosary Potluck the 2nd Thursday of each month, unless other wise noted. All are welcome to pray the rosary— bring a rosary from home or one will be provided. After the rosary is prayed— fellowship and food is shared in the form of a potluck. The event is typically on hiatus June through August. The Knights of Columbus meet at 6:30 P.M. on the 4th Tuesday of every month in the Church Hall to discuss on-going local and national charity works, upcoming events, brothers in need and council finances. The Officers of the Knights of Columbus meet the 3rd Tuesday of every month at 6:30 P.M. in the Church Hall. Where Can I Find a Knight? 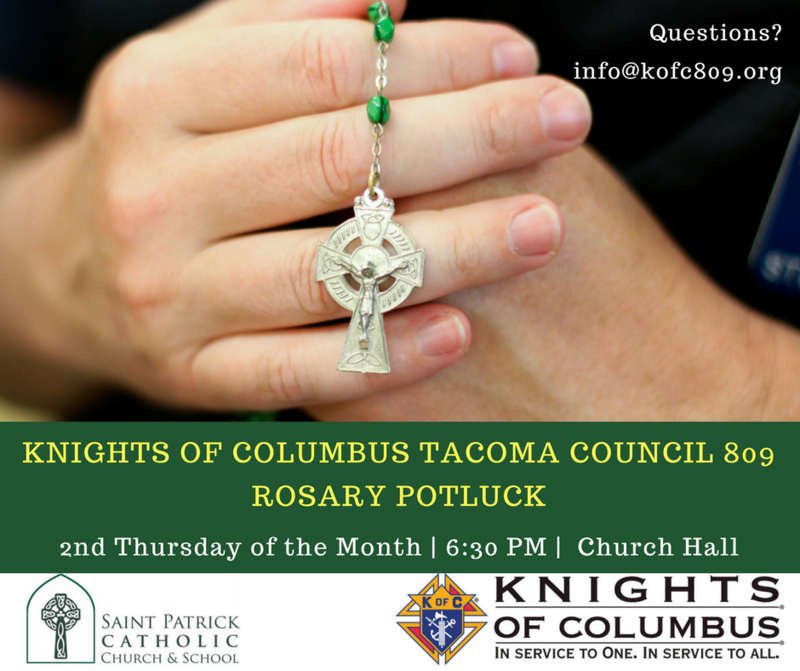 On the first Sunday of each month, Knights of Columbus members wear their name badge, vest or polo shirt (no shining armor) to bring awareness of the Tacoma Council 809s presence in the Saint Patrick Catholic Church community. If you have questions about joining the fraternal Catholic organization, you will be able to easily identify a member to seek out information. Stay connected. Like the Knights on Facebook. I want to join the Knights!